MUFF WIGGLER :: View topic - How many original Buchla Music Easel have been built? How many original Buchla Music Easel have been built? only 13 original Buchla Music Easels have been built back then. Can anyone confirm this figure? The number is likely closer to 30-35 according to somebody who personally knows who owns most of them, and Don's memory. No, there's just somebody who knows where most of them are. BEMI said they shipped 60x the amount that were originally shipped. So BEMI mentioned I think they produced at least 60 times the number of original Easels...means they made 1800 of them??? I have accounted for over 25 original full Buchla Music Easels. Don estimated around 30+ 208s were sold in the 70s. But which cabinet sounds the best!? Sorry to necro an old thread, but it wouldn't let me make a new topic without two replies on a new account and this is the thread google lead me to when searching. So here's the thing... I have one of the original music easels. I didn't know I had it until tonight when I posted my father's old synth machine on craiglist (for a whopping 100 dollars) and got a bunch of replies nearly instantly, some of them kindly informing me that I had something quite a bit more valuable, even if it was currently broken. It wasn't working when my father gave it to me, so I had put it on the backburner as an idea that one day maybe I could resurrect it. I had no idea that there was this sort of cult built around its rarity and $4,000 a unit revival. I have the original manuals and schematic sheets too as well as maybe my favorite thing (just discovered as it was the first time I really looked at everything), two handwritten notes from Buchla and Associates talking about recommending the music easel and how the total cost would be $2700 because my father opted for the 100 dollar silver aluminum case instead of whatever the 250 dollar option was (I assume the blue case?). One letter is dated 4-29-75. Also in that folder is their original 200 series "catalogue", which is a bit funny in modern terms as it's literally just a bunch of loose sheets of paper with descriptions and prices. Anyway, I'm a little overwhelmed by this discovery. My father passed away in 2016 and I'm sure had no idea that he had something that was super rare and I'm told valuable even if not currently working. I don't really have the funds to try to get it repaired and I can't even really figure out what its value is if not working (or really even if it is working) because it's rare enough that even my sweet google skills are failing to find much in the way of price quotes. If anyone could help me out with any advice I'd really appreciate it. Thanks. I think an original easel is worth $25k or thereabouts. You should have it repaired by Rick Smith if you are in Canada or USA. Having it repaired is worth doing and shouldn't be very expensive. If you're in the US or Canada, you can contact Dave Brown, who already repaired one https://modularsynthesis.com/buchla/208/buchla_208.htm or Rick Smith who's in Vancouver. If you're in EU, but I don't think so, I'll be happy to take care of it. Where is Rick Smith located? How does one contact him? Apologies for being an electronic music noob, been a guitar guy most of my life. Vancouver, WA or BC for Rick Smith? I'm in Portland, so either is technically drivable. I'll pm you his e-mail, he's no longer a member of this forum. I was also going to suggest getting in contact with Rick – along with handling any repairs, he probably has a waiting list of people who are looking for vintage Easels. Can also vouch for Dave however. Have to give props to the people who contacted you on Craigslist to tell you its true value! This story could have easily become a new thread called: "You'll never guess what I just scored for $100 on Craigslist"
To put a cap on the story, I did contact both Rick and Dave. Dave seems like an awesome guy but told me that he doesn't involve himself with any selling. Rick ended up arranging a buyer very quickly for quite a bit more than my original 100 dollar craigslist offering. I feel a little bad because I had a lot of what seemed to be true blue enthusiasts contact me who told me straight up that they couldn't afford the collector's price. Wish I was a rich guy who could try to figure out who would get the most out of getting it, but the collector's price ended up too tempting to pass up and who knows, maybe he will get the most out of it. Thanks all very much for the info! Don't feel bad, excellent and affordable clones of the original 70s design exist for the musicians who want to play an Easel, are available pre built or DIY. Original Easels can be left to collectors who want to pay very high price for an old used instrument. Would love to see a pic of your Dad's old easel before you move it on!! Sure - I have quite a few. I think Rick asked for a bunch to make sure I wasn't just google imaging them in a scam. This one I just took after Rick asked me to see if I could defoam it a bit to prep it for shipping. Can see my dad (Vincent McDermott) had inscribed his name on the cross bar. Totally off topic but anyone here knows how many Synthi A, AKS and VCS3 EMS made back in the days? For what it's worth: I'm sure a good lot of us would be happy if you were able to scan the catalog, schematics, and other written materials you're talking about. Obviously you have no obligation to do so, but even those documents are a treasure, themselves! I'd love to read them, and I'm sure that others would as well. Glad this Easel is making its way to new hands! It's a beautiful instrument. Original Easels are generally not items that someone buys and puts on a pedestal in their penthouse, so hopefully the buyer is someone who appreciates how special the Easel is. Who knows, maybe we'll see it in a YouTube video uploaded by a famous or otherwise well-known musician. 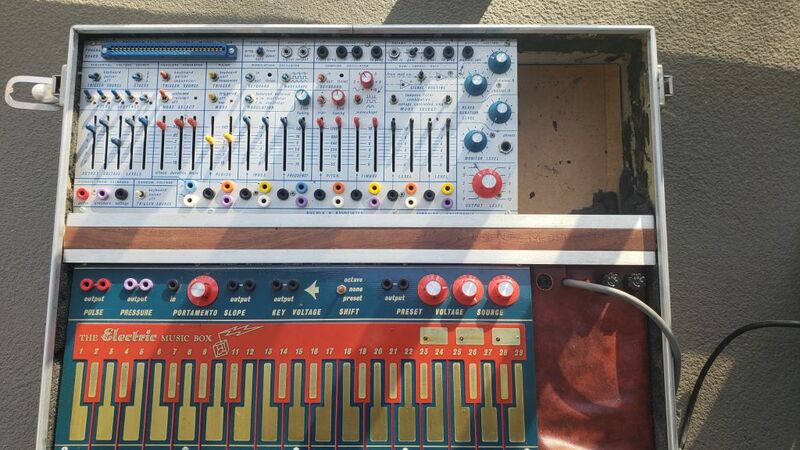 I wish I could find Suzanne Ciani's original Buchla 200 on Craigslist for $100. Wow, fun story, and I'm very happy that you found the assistance you needed to get fair value for such a rare item. I'll second that any photos or scans of the documents would be a treasure many of us would enjoy viewing, if it were possible.